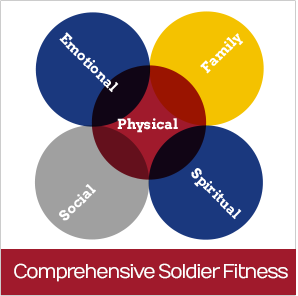 Since 2009 the University of Pennsylvania has been working with the United States Army’s Comprehensive Soldier and Family Fitness (CSF2) program to deliver resilience training programs. The purpose of these programs is to teach resilience skills in order to increase resilience and enhance the performance of Soldiers, Family of Soldiers, and Department of the Army Civilians. CSF2 is a long-term, enduring initiative in the United States Army that broadens the assessment and training of every member of the Army beyond the standard physical and technical abilities. Psychological strength, like physical strength, does not just "happen"- it must be trained, practiced, and refined. Therefore, due to years of demanding deployments, coupled with the health of the force issues that the Army faces today, a focus on comprehensive fitness has become a readiness mandate for the Army community. CSF2 delivers resources that are a true prevention model, whose goal is to build resilience and enhance performance. Though CSF2 is largely focused on training skill sets (and how and when to apply them), it does delve into the root cause of emotions, thoughts and actions; what psychologists refer to as "meta-cognition." CSF2 is a programmatic first step towards teaching members of the Army community to understand how and why they think a certain way. Once people begin to understand this, they are better able to change their thoughts and actions to strategies that are more adaptive and more likely to result in desirable outcomes. The CSF2 program focuses on the ninety plus percent of the force that is fundamentally "well," but at widely varying levels of fitness in each dimension of strength (emotional, social, physical, family, and spiritual). The goal is to create a force of “optimally fit” individuals who can overcome stress-producing events and grow from these experiences. People who are optimally fit are more likely to pursue high levels of responsibility and to perform well under pressure; also, they have the decision making skills and communication skills to be successful in life. Additionally, when facing uncertainty and adversity, these same skills help these individuals to put the problems into an appropriate perspective, find meaning in their lives, reduce rumination and catastrophic thinking, and focus on finding solutions. The CSF2 program recognizes that developing human resilience is a life-long process. There is no "end state" for a person's resilience; one can always improve. Therefore, the need to develop human resilience is enduring, and CSF2 continues to evolve as the Army community's resilience develops and its needs change. Casey, Jr., G.W. (2011). Comprehensive Soldier Fitness: A Vision for Psychological Resilience in the U.S. Army. American Psychologist (66), 1, 1-3. Peterson, C., Park, N., & Castro, C.A. (2011). Assessment for the U.S. Army comprehensive soldier fitness program: Global assessment tool. American Psychologist (66), 1, 10-18. Reivich, K.J., Seligman, M.E.P., & McBride, S. (2011). Master resilience training in the U.S. Army. American Psychologist (66), 1, 25-34. A recent Army report concluded the Master Resilience Training program has been effective. Dr. Seligman wrote about resilience training in the April 2011 edition of Harvard Business Review. Times Magazine article about post-traumatic growth and the Comprehensive Soldier & Family Fitness program from March 22, 2012. Front-page article about the Comprehensive Soldier & Family Fitness program from the August 17, 2009 edition of The New York Times.